Considering it’s been put together in a somewhat ad hoc manner, I think it’s working well! It is looking fantastic! It is such a wonderful idea, something that has touched a cord with so many people. Thank you. I’m really pleased that there has been so much interest. I think that there will be one more ‘column’ of squares… I know of at least five more that are on their way or nearly done and I have some ‘meditation squares’ to add if there are spaces to fill. so beautiful, and so many memories all wrapped up in it. what an awesome thing to have. Especially nice to have the scrapbook too, which is also coming along nicely, but much more difficult to photograph! Only the slightest planning – the central nine squares (around and including the sunflower) I did think about. After that I just added them in batches pretty much at random, although trying to avoid putting similar colours together and spreading out the very bright, very pale and very dark ones. It has come out surprisingly well all things considered. The skeleton is my own design… need to chart it properly, but that’s another job on the list! You’re going to have a big project gap when this beauty’s done, not only because the course is finished, but also because of the fun and fellowship it’s generated. I’m glad you’re starting the tree project – something new to contribute to for all of us who’ve become fascinated with the process of collective creation! 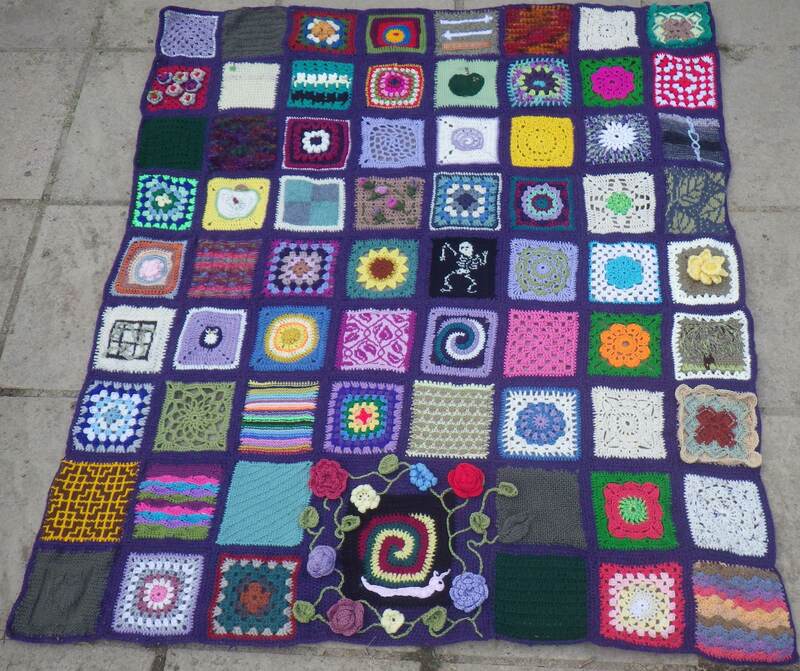 Tomorrow is the first ‘Cake and Craft’ when we start our charity blankets… there’s never a dull moment!!! It’s looking absolutely fantastic. A real tribute to all the contributors and to your skills at combining all the different pieces. I haven’t counted up how many contributors there have been yet, but I think it should be about 30 in the end – amazing! So pleased with it… amazing that it works so well considering the only guidance about the squares was their size! That is already looking gorgeous. What is more wonderful, is the fact, that all of us are bound by this permaculture concept this blanket symbolises 🙂 This is turning out to be a huge blanket with 9X9 , 81 squares !!! Fantastic. I think there will be nine more… I know of five that are on their way or ready for collection and I have a few of my own in hand if I need some to get the numbers right. I think the edging is going to take quite a while and I’m still dithering about what sort of stitch to use. Fortunately I do have lots of the blueberry yarn so I’m not limited by that. The snail was made by ‘young at fifty’ (http://youngatfifty.wordpress.com/) and embellished by me… a collaborative effort! Aw, it’s just gorgeous and love the flowers on it 🙂 I will have to learn to crochet one day, I love the look of it. I only learned about 18 months ago… I’ve been able to knit since I was a child, but crochet took me about 40 more years to get the hang of!! Better make a cake now, otherwise it’s just going to be ‘craft’ this afternoon! It was lovely… I could take you to the next one if you are feeling up to it! He’s being a very well-behaved snail at the moment… all leaves and flowers still in tact!